If you missed Mussels Part 1 you can check it out over here; it includes a the recipe for Fennel Orange & Gueze mussels and some helpful tips on cleaning & storing the yummy little bivalves, the most intimidating part of making mussels at home. This post is two more recipes, using different styles of beer, a Belgian double and a Belgian style amber, and some different flavor profiles, a creamy bacon & bleu cheese and a Belgian classic with leeks & tomato. 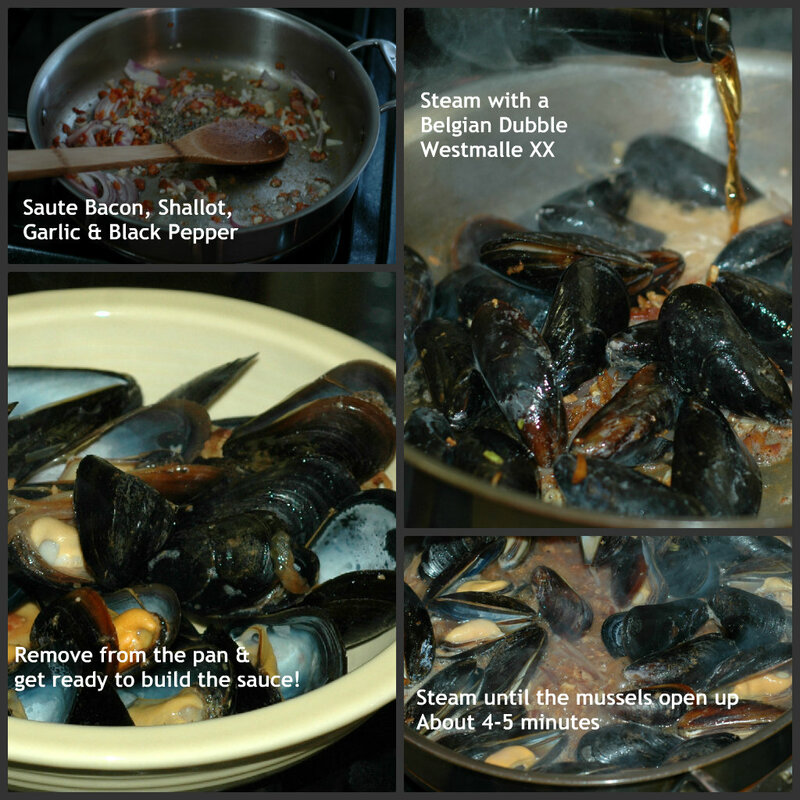 I very deliberately chose these 3 recipes to share; together they hit on a variety of ingredients that will allow you to learn how to build a flavorful sauce, using each ingredient to get the maximum amount of delicious while cooking the perfect mussel. I know I already said this, but I think it bears a brief repeating so bear with me if you already know and go do some reading over here if you want/need more details. Mussels are the stars of their own show. Like most seafood & shellfish the best sauce in the world will not save what has been improperly cleaned & stored or over/under cooked. Make sure you buy your mussels fresh from a reputable source, make sure the shells are closed and there is no visible damage and ask for their harvest date if you can’t pick them yourself. Clean & store your mussels properly when you get home and keep them refrigerated until you are ready to cook them. Keep them covered with a damp towel, preferably in a way that they can drain, in the refrigerator. If you can’t keep them drained rinse before cooking. When you cook them only steam them until they pop open and remove them from the pan, it won’t take more than 5 minutes. Let them sit in a bowl while the sauce is finishing, pouring the sauce overtop reheats them perfectly without over cooking. If your impression of mussels is tough or grainy you have never eaten a properly cooked mussel; they should be plump, sweet and tender and are if they aren’t cooked to death. 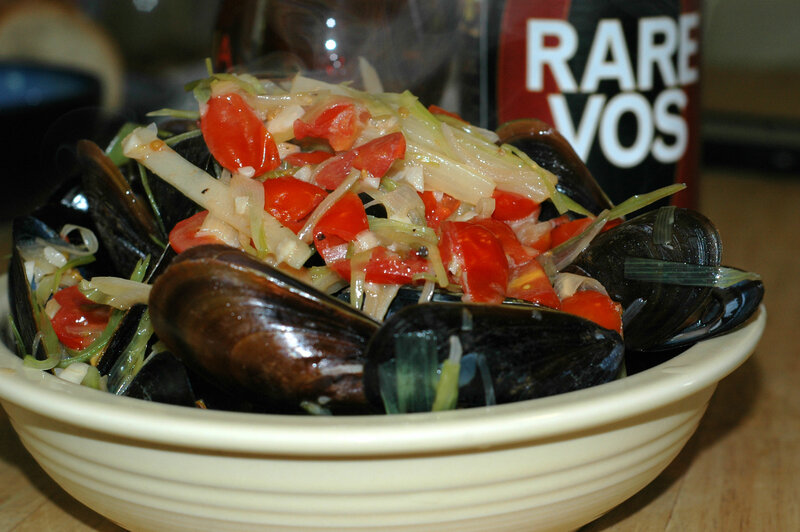 First on the list is a Belgian classic – mussels steamed with leeks & tomato in an amber ale. My first choice is generally DeKoninck, but there was none to be found on that day where Hart was so Ommegang Rare Vos was the Plan B. To be honest this is not a beer I really like to drink, but dig it for cooking. It has a pretty solid maltiness that reduces well and the overall taste of the beer, spice & citrus, is strong so it sticks around, in this kind of application you want to be able to taste the beer. What is a Leek & what do I do with it? Leeks look like gigantic green onions and can be found at the grocery store. They like to leave them bundled in threes, I untwist tie them and take the one I need; three leeks is a LOT of leeks. Leeks have a mild onion-y flavor, are more delicate than an onion and in turn, more elegant. You only want to cook the white & light green parts of a leek, the dark parts are fibrous and bitter. Leeks are grown in sand, so it is important to clean them well – gritty sauces are icky. To prep the leek – Fill a deep bowl with cold water. Cut off the dark green top & discard. Trim off the root end, clean off any bad outer layers and cut remaining piece into 2 sections, each should be 2″-3″ long. Cut each in half lengthwise to get 4 half circle shapes. Lay the leek on the flat side and cut into thin strips, a julienne, and place in the bowl of cold water & agitate to remove any grit. Leeks float so the grit and sand will drift to the bottom of the bowl, you need to have at least 1″ of empty water underneath the leeks so that can happen. DO NOT POUR THE LEEKS OUT OF THE BOWL. That will undo all the cleaning you just did. Remove them from the water and shake to dry; I usually do this as I add them to the pan, the extra water will cook off quick. 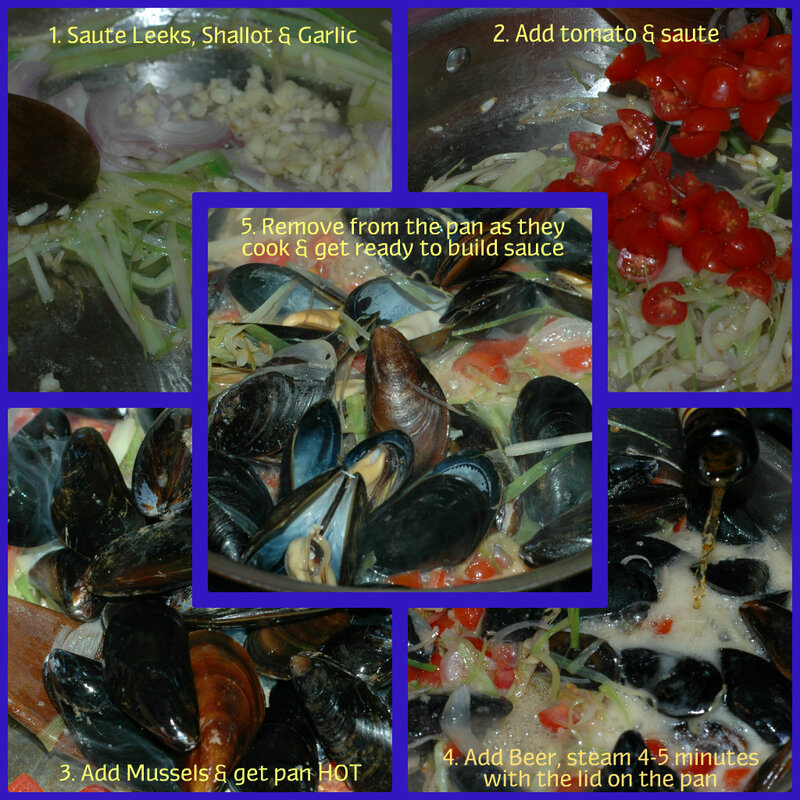 Get all your prep done – clean and/or rinse the mussels, julienne the leek & shallot, quarter the tomatoes, mince the garlic – you want all your stuff ready to go before you start. Heat a large saute pan with lid that fits over medium heat and melt 2 Tbsp of the butter. When the butter is melted add the leek, shallot and garlic. Sweat over medium heat until the leek is tender and translucent & the garlic smells sweet. Turn up the heat to high, add the tomato & saute until the pan is again hot. Add the mussels and toss with the aromatics until the pan is seriously hot again. Add the beer, lots of hissing and steam should occur, and lid the pan. Let it steam for 4-5 minutes. Remove the lid & see whats happening under there; mussels should be open and ready to be removed from the juice. Use a slotted spoon (or your fingers if you’re tough enough :) to transfer the mussels to their serving bowl, any that aren’t open at this point are trash. Some of the aromatics may decide to join them, not a big deal at all. Reduce the remaining liquid in the pan over high heat by about half, until it is thickened & bubbly, the tomatoes should also have completely cooked down into the sauce, too. Add the fresh parsley (if you are using it), season with salt & fresh ground pepper and add the remaining 4 Tbsp of butter, swirl in to thicken the sauce and round out the flavors. Pour over the steamed mussels & serve immediately with a pile of crusty bread – this sauce is my favorite for bread sopping. No joke. Our next mussel adventure takes us someplace, well, kind of weird. Bacon, cream, bleu cheese & a Belgian double. Not normally things that I would think to use when preparing seafood, but a line up that compliments mussels exceptionally well. 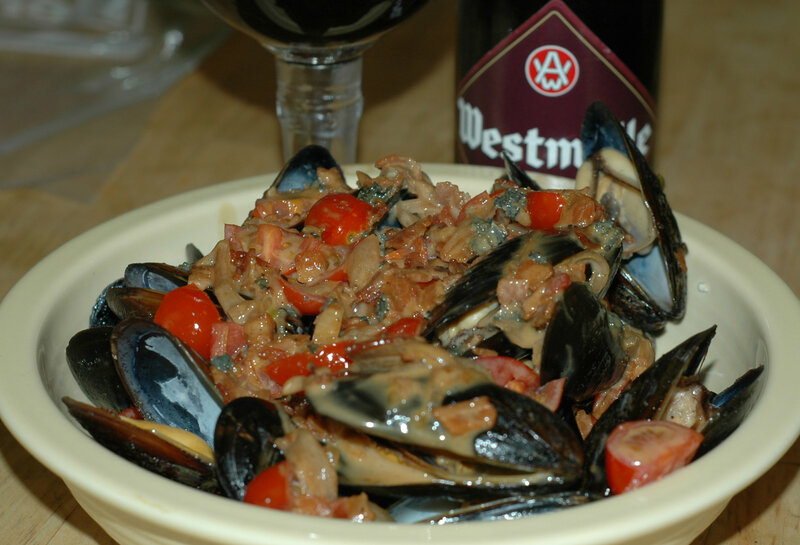 I know it sounds weird, I don’t even really LIKE bleu cheese, but this sauce is an amazing balance between the fruitiness of the beer, the smokey-salty of the bacon and a mild bleu cheese funk that is truly delicious all over perfectly cooked mussels. I generally avoid bleu cheeses completely, I am oddly sensitive to the ammonia-iness of it for some reason, but I will eat the hell out of these AND sop up the sauce when I’m done. Moral of the story don’t automatically discount these because of the bleu cheese, you will be missing out, and besides the bacon in there trumps all! As to the kind of bleu cheese – I used a creamy buttermilk bleu from Roth Case. It is very reasonable priced for the quality and is one of Hart’s favorites so he would eat the rest – the recipe only needs a few tablespoons. Any decent bleu cheese will do but I would steer clear of the pre-crumbled kinds, they are cheap cheese, don’t always melt right and have a harsh funk to them I don’t dig in this dish. Couple of random recipe notes ~ I don’t add the tomatoes in with the aromatics. This is deliberate. I don’t want the tomato to cook into the sauce, I want them to be bright pops of freshness in the sauce so they go in after the mussels are cooked. I also started this recipe with raw bacon, but you can always chop up some leftover cooked bacon – chop it up and crisp it in the butter. It cuts down on the cook time for the aromatics significantly, but you do miss some of the bacon fat you get from rendering it out. You don’t need to get all the chopping done first with this one; get the bacon cut, melt 1 Tbsp of butter in a saute pan with a lid that fits. Add the bacon and render until crisp. I take my time on this nd do all the other chopping prep while the bacon cooks, I want it to get nice & crisp so it doesn’t get soggy in the sauce. When the bacon is crisp add the shallot & garlic, season with a healthy amount of fresh ground pepper and cook over medium heat until both are tender and smell sweet. They can take on some color, this only adds to the flavor, but be careful not to burn. If you do start over – there is NO saving burnt bacon. At all. Crank the heat up and add the mussels. Saute to toss with the aromatics & get the pan screaming hot again. Add the beer, to a chorus of steam and hissing, then lid. Steam for 4-5 minutes over high heat. Remove the lid and start taking out the mussels with a slotted spoon, leaving the pan on high heat. Any mussels that aren’t open at this point throw away. With the broth at a boil add the cream, stir in to combine and reduce by about 1/3. Add the tomatoes & broken up bleu cheese, stir to melt and reduce until the sauce is thick & bubbly. Taste it, season with salt and more pepper if needed and add the remaining 4 Tbsp of butter. Swirl in to melt and finish thickening the sauce. Pour directly over the mussels & serve with, you guessed it, a mountain of crusty bread. 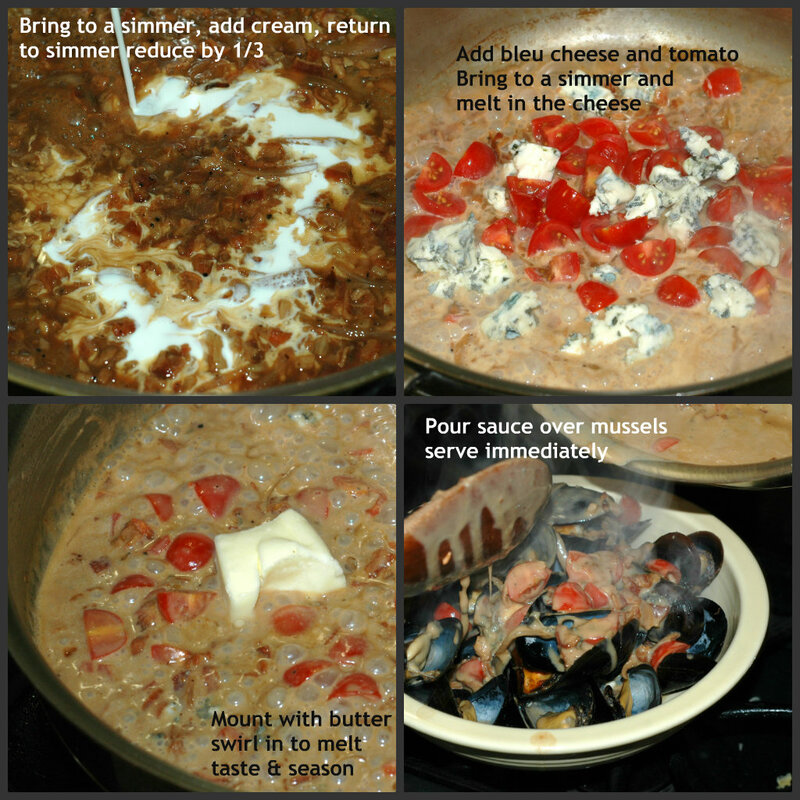 I think you are ready to create your very own mussel feast at home now and sincerely hope you do, it really is a fun dinner over cold beers and any food meant to be eaten with your fingers a win in my book. These recipes should give you a good place to start from to create some of delicious dishes of your own, play around with flavors you like and beers you think will taste good. I’d love to hear about your favorites or creations!